Apartment A was freshly re-decorated in Jan 2018. All prices discounted for all dates in JANUARY,FEBRUARY. I have 2 apartments in this building one A is located on 3th floor and second B on 4th floor with same layout and standard , just a bit different taste of decor as you can see on photos.Please enquire about availability and best price. Meadowbank shopping centre with Sainsbury's superstore open daily from 6am to 10pm,M&S,TKmaxx,KFC and more is just 5 minutes walk from the apartment. Our Edinburgh apartment is the ideal hub from which to access Edinburgh City Centre and Princes Street, be it for business or pleasure. We are just about 15-20 minutes walk from the Scottish Parliament, The Royal Residence at Holyrood Palace, the Royal Mile, Princes St. Playhouse,Artur's Seat and most of the main attractions in Scotland's capital city. Located in the modern Horizon development next to Lochend Loch and Lochend Park. Our apartment is also ideally situated for access to The Shore in Leith, where you will find a plentiful supply of pubs,restaurants, including Michelin Star dining and the Royal Yacht Britannia in Ocean Terminal Shopping Centre. Also nearby the apartment there is very good bus connection available with 24 hour service and a Tesco super store open till midnight. Sleep uo to 6 guests.The apartment is on the 3rd floor with lift access in the building. There is a living room with large double sofa bed, coffee table, flat screen TV, DVD and French windows that open to a balcony where you can enjoy morning tea or coffee with a superb view over the park and the pond. The dining area has a big table with 5 chairs. The apartment is fully equipped with kitchen appliances: large fridge/freezer, dishwasher, oven and hob, microwave, kettle, toaster, washing machine, cutlery and crockery. The master bedroom has an en-suite with a stand in electric shower cubicle, a kingsize bed or 2 single beds, a good size built-in wardrobe and big double windows with a superb view of the Carlton Hill and Arthur's Seat. The 2nd bedroom has 2 single beds or 1 super kingsize bed, a built-in wardrobe and a view of the park. The main bathroom has a bath with an over bath shower. There is a separate cupboard for shoes and jackets. Genius luxury 1500 pocket sprung and hypo-allergenic mattresses -hotel style zip and link beds so can be make up with 2 single beds or a king size bed in each bedroom. The building also has a secure entry system and CCTV. Double glazing and gas central heating. Free Wi-fi internet access. We provide a 'meet and greet' service, whereby we will meet you at the property to hand over keys, show you the layout, provide local information and answer any questions you may have. (Alternative time check-in, check-out can be arranged directly with the property owner before arrival). coffee, tea, sugar, milk and set of basic cleaning products (washing powder, washing machine tablets, liquid for dishes, liquid soap, toilet paper, garbage bags) . accommodate up to 2 cars.There is lift access to the apartment and the underground car park. A security refundable deposit of £150 or 150 Euro is payable on arrival (in cash) and I will give you back at check-out day.If you prefer pay deposit via website please let me know before you book the apartment. It is a no smoking apartment but you are allowed smoke on the balcony. The way to get to the apartment is take a bus number 100 (ticket costs £4.5 per person) from airport to Waverley Station(travel time about 25 minutes) and then taxi (taxi costs around £6-8) to the apartment or you can ask how much will be taxi from the airport to the apartment because it could be the same price (around £25)as bus tickets especially when is few of you. Taxi from the apartment to Edinburgh airport cost about £25. Taxi from apartment to Waverley Train Station,Royal Mile and Princes St. cost about £7. Or you can walk about 15-25 minutes to Waverley Train Station,Royal Mile and Princes St. There are a number of local bus services that go near the apartment from Easter Road bus 35 and 1. Bus no.35 will take you in minutes to Scottish Parliament, The Royal Residence at Holyrood Palace, the Royal Mile,National Museum of Scotland, Old Town and direct from Edinburgh Airport to the apartment, ticket cost £1.60 per person. Bus no.1 will take you in minutes to Princes Street and West End. Bus no.26 will take you in 20 minutes to Edinburgh Zoo or opposite direction to Portobello Beach( Edinburgh's seaside ). This is our family business,our guests will be treated like the one and not as one of hundreds. From the moment you send to me inquiry till check-out you will contact with one person ,me (not someone else sends quote, someone else check you in and if the any problems contact with someone else) I am not working in office hours 8 do 18, I am available 24h 7 days a week to serve to help you at any time. Modern and spacious apartment in a quiet area, away from the hustle and bustle but just a few minutes walk to most attractions in Edinburgh. Apartment has free car park,lift, gas central heating and double glazing. 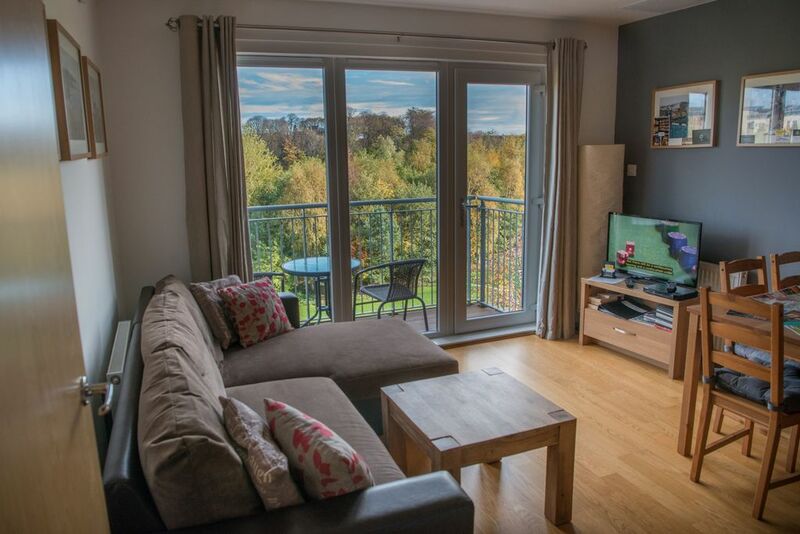 The apartments are located next to Lochend park where you can go for walk or play with your kids or just enjoy superb view over the park from the apartment. Both apartments have large balcony where you can enjoy your morning coffee or in the evening with glass of wine. Fantastic location, brilliant amenities and amazing owner. Couldn’t fault our stay. The apartment had everything you’d hope for and more! The owner was very kind and helpful. The extra touches around the apartment were appreciated and made our stay much more enjoyable. Thank you. Slawomir is a delightful and professional host. The apartment, with a great view of the park and river, was immaculately clean and all our needs were fully provided for. A large supermarket is a few minutes from the apartment. It was quiet all the time and the public areas of the building were also very clean. You can park your car safely or if needed the bus service is also just minutes away. You will be very happy if you choose this property. Many thanks Slawomir! Great time in Edinburgh. Need a longer holiday next time. Apartment excellent very clean close to restaurants and shops owner very very nice and helpful. Would definitely recommend. A great apartment, it appeared to be well equiped (we didn't cook while there), Sainburys was really close by and not to far to walk into the city centre. Many thanks for fab review. Slawomir is the best host we ever had. He is warm helpful and always responsive. There was some problem with the flat we booked, he upgraded us to avoid disappointment. On arriving, he gave us hands on information for the tour; after leaving, he posted the books my child left for us. The flat we stayed was well equipped at convenient location. We had great time in Edinburgh. Thank you so much for fab review and kind words about me I really appreciate it. Slawomir met us on arrival, gave us a tour of the flat, told us about the views of Arthur's Seat and Calton Hill and gave us lots of information about things to do in Edinburgh. That was much appreciated by all 4 of us, as it was our first visit to the city. The flat was clean, beds and seating comfortable. Slawomir asked what he could do to improve - nothing much, though we would have found it useful to have a mirror in each bedroom near an electric socket for when we were drying our hair. We improvised by using the tall hall mirror, so it was not a big problem. We had no hot water on the last day, but Slawomir was on hand to talk us through adjusting the water pressure to get the hot water back - he had already arranged for a boiler service and it was his bad luck that this happened before the service was completed. We appreciated Slawomir being available to help with such difficulties. The apartment is near local shops and cafes and within walking distance of all we wanted to see - Calton Hill, Royal Yacht Britannia, National Museum of Scotland, Christmas Market, Edinburgh Castle.............we had a wonderful long weekend. Thank you so much for fab review covering so many details and kind words about me I really appreciate it. The bus number 100 from Edinburgh Airport to the Princes St, ticket cost £1.60 per person then taxi to apartment cost around £8 more info on website lothianbuses.com or taxi cost approx. £25.00. Our Edinburgh apartment is the ideal hub from which to access Edinburgh City Centre and Princes Street, be it for business or pleasure. We are just a 15 minutes walk from the Scottish Parliament, The Royal Residence at Holyrood Palace, the Royal Mile, Playhouse,Artur's Seat and most of the main attractions in Scotland's capital city. Located in the modern Horizon development next to Lochend Loch and Lochend Park. Prices may be subject to change at the advertiser's discretion Mid week ,Long stay discount available for 7 or more nights on request. Late Deals available on request. Less than 3 nights stay is available depending on season and availability. A security refundable deposit of £150 or 150 Euro is payable on arrival (in cash) and I will give you back at check-out day.